It's something of a cliché to say that there's a fine line between genius and insanity, but sometimes clichés are clichés because they're true. Artist Chris Burden spent a good deal of his career balancing on that line, and on occasion perhaps crossing over it. Of course there are those who would argue against him getting anywhere close to the genius side, too. Such is often the case with modern art, and the kind of performance art that brought Burden his initial fame in particular. But for all the dismissals of his work by the art establishment, his influence has persisted. And like many once controversial artists, by the end of his career Burden very nearly was the establishment via public art installations for the city of Los Angeles, notably his iconic "Urban Light" sculpture. 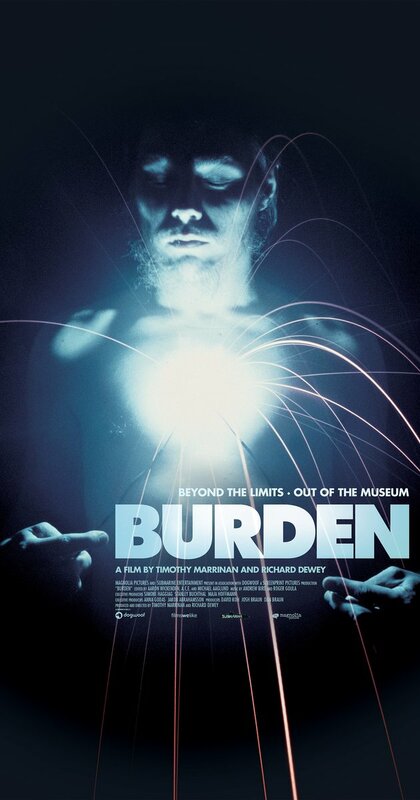 And yet, somehow, I had never really heard of the guy before watching BURDEN, a new documentary on the controversial artist from co-directors Richard Dewey and Timothy Marrinan. The film itself is fairly standard documentary fare – lots of archival photos and film clips, and the expected parade of talking heads. But its subject is never less than enthralling. The son of highly intelligent and somewhat eccentric parents, Burden initially intended to go into architecture. When he found out how little room there would be for personal expression if he pursued that career, however, he decided to become an artist instead. But Burden was not interested in ordinary painting or sculpture, either. His work was conceptual, often ephemeral. It was also, on many occasions, dangerous and alarming. Burden's best known performance pieces from the seventies, early in his career, included "Shoot", in which he allowed a sharp shooter to shoot and wound him, and "Transfixed", in which the artist had himself nailed to the back of a Volkswagen Beetle. Say what you will, but these pieces got attention and made people think. Perhaps most of the thinking going on was about whether or not this guy was crazy, but nonetheless, Burden got a reaction. As one might guess when dealing with a person willing to go to such extremes for his artistic vision, Burden was no picnic for friends, family, and associates. Not surprisingly, Burden's personal life could often be a disaster. And yet somehow, this crazy visionary managed the transition to less extreme works of art that still remained true to his themes and ideas. Look, it's easy to understand those who think even Burden's more restrained later art is garbage. The film gives an airing to that viewpoint via interviews with British art critic Brian Sewell. But even if you can't quite find it in yourself to appreciate Burden's work as "art", there's no denying that his life story is an interesting one, and his influence, for good or ill, has been lasting. 3 ½ out of 4 stars.